This enterprising programme spans ten years of Mozart’s compositions for piano, from the earliest work, K242, written in his twentieth year, to the celebrated Piano Concerto No. 21. The six pieces here thus trace Mozart’s development to maturity, demonstrating how he progressively explored a gamut of pianistic idioms and expressive possibilities. 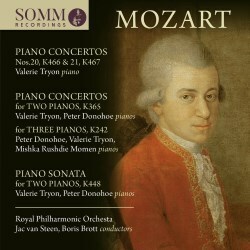 The permutations here range from employing no fewer than three pianos in that earlier work – although the third solo part is admittedly comparatively simple, having presumably been written for a child – through the lighter middle-period works for duo, to the profound and monumental, single-piano concertos of the mid-1780s. Veteran pianist Valerie Tryon, recording in her early eighties with the zest and dexterity of a much younger artist, plays all the works requiring only one keyboard and for the duos she is joined by Peter Donohoe, who himself might, in his mid-sixties, also be accounted a veteran at this stage of his career – but as we know, pianists, like conductors, can soldier on forever. They in turn are joined for the three-piano concerto by the prize-winning young pianist Mishka Rushdie Momen. All three are more than adequately supported by the Royal Philharmonic Orchestra, exhibiting rich tone and especially mellifluous woodwind; a proper sense of dialogue and partnership prevails here. The sound is exemplary, with pleasing balances and proper separation between the pianists and the notes are informative. I liked everything about these recordings. Despite the length and success of her career, I was unacquainted with Tryon’s playing but love her manner, which is relatively restrained, reminding me of the classically styled pianism of Clara Haskil or Annie Fischer: fleet, musical and unpretentious but with formidable powers of concentration and intensity. The middle-period works from the 1770s such as the delightful Concerto No 10 for Two Pianos, presumably written by Mozart to be played with his sister Nannerl, are not as profound as the two big concertos on CD1 but they are full of grace and exuberance, teeming with fresh ideas. Tryon successfully encompasses the wide range of emotions of the later works, from their drama and turbulence to the disarming, lyrical simplicity of their middle movements. The contrast in moods between the works written at the beginning and at the end the ten years covered here in this set is especially underlined by the juxtaposition of the galant style of the early Concerto No. 7 for Three Pianos with the brooding suspense of the D minor opening of K466, my personal favourite among Mozart’s mature piano concertos.